Hogs aren't nearly as fat as they used to be -- and that's a problem. “Fifty years ago we couldn’t have done this,” says Al Snedegar. Standing in the center of the Clinton County, Michigan 4-H fair livestock arena, just out of reach of the late-July sun, Snedegar is an award-winning retiree of Michigan State University and the day’s swine judge. He addresses a dozen youth and a crowd of spectators at least 100 strong. The kids are showing off pigs they raised as part of a market hog class. They each drive a pig weighing between 280 and 300 pounds around the arena as he speaks. Long identified with gluttony and excess, hogs haven’t been the portly figments of our imagination for decades. Not that they’re smaller. They’re bigger and grow faster than any time in history — they just don’t have nearly as much fat. In fact, to accommodate the rapid refinement of the lean market hog, USDA pork carcass grades have been revised three times since 1952. Carcass grading is the system the USDA uses to assign quality and value to swine raised for meat. Pork carcasses are assigned a grade of U.S. No 1 through U.S. No 4, based on the expected amount of four lean cuts – ham, loin, blade shoulder and arm – to be gleaned from a given pig. To assign the grade, the USDA uses a formula that takes into account muscling and the depth of the backfat present over the area of the back directly above the pig’s last rib, trying to determine the proportion of fat to muscle. Dial in the right proportion of fat to muscle, and get a higher grade. Over time, this means more and more muscular pigs. Hogs whose carcasses earn higher grades demand a better price per pound than those who are graded lower, so there’s plenty of incentive for farmers to bring to market the types of hogs that will meet the definition U.S. No. 1. Which might have been a good thing if we had settled on a top spot that wasn’t so detrimental of the final product. We engineered pigs for consumers who wanted leaner meat, and now we have a tasteless product that many don’t want to buy. 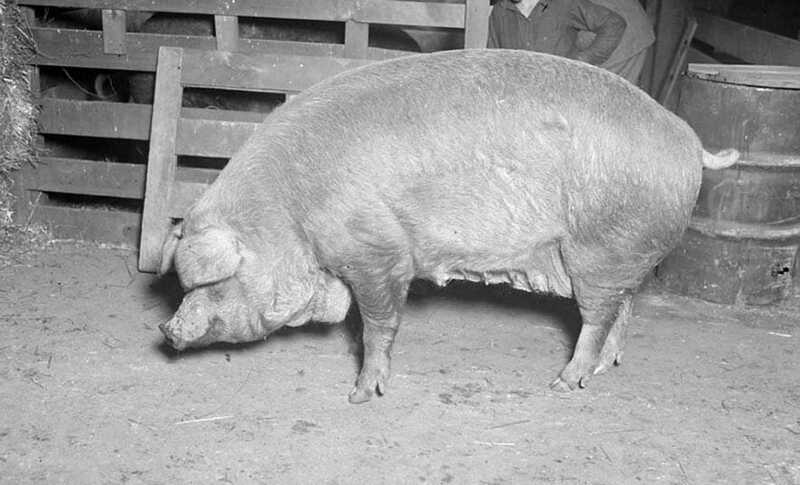 In the ’50s and ’60s, hogs grew leaner so rapidly that less than 20 years after implementation, the top pork grade was found to be a completely inaccurate way to evaluate the more muscular hogs coming to market. In 1968 it was eliminated entirely, completely new standards of leanness and muscling were created, and the former gold standard was reintroduced as “U.S. No. 2.” In the span of just sixteen years the best hogs America had to offer were dethroned, pushed aside by leaner versions of themselves. A decade later, a 1980 survey found that seventy percent of hogs brought to market were earning the revised U.S. No. 1 grade, prompting a similar revision in 1985. Advances in our understanding of swine genetics, nutrition, housing, and the way we bring hog feed to the trough are all partly responsible for this shift. We now have pigs with the genetic propensity to grow quick and lean, and with the right nutrition we have the ability to make it happen faster all the time. But it’s not only farmers who have pushed the pork industry into what it has become. We owe a large extent of our thanks for that to a demographic who has changed almost as rapidly as the hogs themselves: American consumers. In 1956 the University of Illinois released a short instructional film called “Pork People Like.” It starred the fictional character “Frank Farmer” who was producing lean hogs for market. Or, as the film put it “hogs that will make the buyer happy” because they’re “not overfat but long and meaty.” The second star of the film was the “American Housewife.” Shown shopping at the supermarket, the film explains that this “determined young lady” is the person “everyone in the meat industry … is trying to please.” As she strolls down the meat aisle turning her nose up at fatty pork cuts, she serves as a grave warning to the intended audience of the film: farmers who still raised hogs the way only a handful do now – outdoors, in dirt pens, and pasture-based systems. Keep raising fat pigs, the film says, and you’ll find your own profits growing lean. At the time the film was made, the roughly 88 percent of women whose primary duties resided within the home – raising children, cleaning and cooking – were voting for leaner cuts of meat at the grocery store. They were passing up marbled pork chops with an ample ribbon of lard down the back for chicken breasts and lean beef steaks. The prevailing wisdom of the day was that vegetable fats like Crisco worked better, were healthier and more economical. With physical labor on the decline and a population increasingly accustomed to affordable staples, women whose job it was to feed their families didn’t want to overfeed fat or waste money on lard that would cook away to drippings in the pan. Concerned with declining sales, the pork industry set out to help hog farmers bring pork that appealed to consumers to the market again. At first, the shift was a positive one. Frank’s meat-type hogs in the mid-1950s were fatter than our fattest pigs today, but leaner than what had come before. They provided bang for American families’ food buck without compromising flavor — no one needs two full inches of backfat, anyway. But since Frank Farmer originally took his meat-type hogs to market for the camera, many American consumers have grown even more health conscious, and remain leery of products they perceive of being high in “bad” fat, which had become synonymous with animal fat. So, even as pigs grew thinner, consumers continued to equate pork with fatty excess and demanded it become leaner still. What started as a PR campaign for pork resulted in bland, unforgiving meat that upon cooking doesn’t render enough fat to keep a layer of lipids on the pan. We engineered pigs for consumers who wanted leaner meat, and now we have a tasteless product that many don’t want to buy. Fifty years later, we’ve begun to rethink our ways, and a handful of pork producers are trying to breed pigs that provide the kind of pork only the tastebuds of the oldest Americans have experienced, but there’s no simple solution. Not only has the way pork tastes changed radically, the way it’s raised has as well. Going back isn’t as simple as flinging open the barn doors. Fat isn’t just good for flavor, after all. The hogs of yore also had the fat coverage needed to weather the elements of their environment. Without it they’re ill prepared to thrive outdoors. When farmers in the ’50s, ’60s and ’70s bred hogs capable of producing the type of pork American shoppers wanted, they also moved their operations indoors where temperatures could be regulated and creature comforts supplied. Barn space is an expensive commodity, so swine living areas shrunk significantly as changes were made, and previously used fields were turned over to other forms of food production. In 30 years time, the U.S. was breeding half as many pigs, while at the same time doubling output through more productive breeding practices and meatier carcasses. Which all sounds good until you realize that while we were busy meeting consumer demand we weren’t busy learning from our mistakes. Fifty-seven years after Frank Farmer made his debut, the National Pork Board — the entity now responsible for pork’s public image — is at the marketing drawing board again. Their last PR campaign, “The Other White Meat,” resulted in the very problems we’re trying to fix — hogs that produce meat so lean American consumers are turned off by the quality. So now they’ve devised another plan that promises little more than a band-aid. The group partnered with the beef industry to rename cuts of pork after high end beef steaks, hoping to attract consumers back to pork after years of dried-out chops for dinner. Which, I suppose, is where it gets personal. A little less than a decade ago I became an inadvertant farmer. What started with a few dozen meat chickens in our backyard rapidly evolved into a small business, and then a larger one. Hogs joined the farm roster just a few years in and have since become its main fixture, with a breeding herd capable of putting more than 57,000 pounds of pork on the table each year and on target to grow to a level of more than 166,000 pounds by early 2014. It’s a drop in the bucket of U.S. pork production capacity, an industry that produces more than 22 billion pounds of pork per year, but an impassioned drop all the same. My first road trip in pursuit of swine was an eight-hour drive south to a commune in the rolling hills along the Indiana-Kentucky border. They were smaller than I expected and smelled worse on the eight-hour drive back north, but somehow didn’t dissuade me. Fat and slow-growing, they were everything I expected, but I would quickly learn they weren’t eveything I needed. Their pork was delicious, but they were prohibitively expensive to raise and their carcasses yielded very little — USDA grading aside. They were the extreme opposite of the modern market hogs that evolved from Frank Farmer’s stock, and within months I knew I’d made a mistake. Since then, I’ve traversed most of the Midwest, spending countless hours sharing the confines of a vehicle with one pig or another, determined to recreate the Holy Grail of American hogs; the type America once had, but let slip through her fingers. You see, while we were reducing the U.S. breeding herd by fifty percent we were also refining the gene pool. It wasn’t just lean meat we were after, but a specific sort of lean meat. The kind that’s uniform and easily packaged. Consumers wanted pork that looked like chicken, but that also didn’t vary too much from one chop to the next. So as the breeding numbers dwindled and pigs were refined for type, those who didn’t fit the bill were culled from commercial herds and their numbers fell even faster. Saved from extinction in the relative obscurity of hobby farms and homesteads, the breeds of swine we now know as “heritage hogs” have made a comeback in recent years and hold the key to the re-creation of delicious pork, but farmers like myself who endeavor to raise them face an uphill battle. Most have either been “improved” almost to the point of modern confinement breeds or not at all. Those that have been improved are already too lean and missing the point of good pork. Those who haven’t are so inefficient they cost twice as much to raise and yield so poorly consumers rightly question the value of the pork they produce, a remnant of a bygone era that fails to be competitive in the modern world. There’s a delicate balance between too lean and too fat, too efficient and too slow growing. Teeter too far in one direction or the other and we’re either quite literally betting (and losing) the farm or repeating the mistakes of our industry’s most recent history. The pork of yesteryear would not stack up to the modern grading system — it’s too red, too marbled, and too moist — but that doesn’t mean it shouldn’t stack up against a set of standards at all. And perhaps standards that nestle comfortably into that sweet spot between flavor and efficiency is what we finally owe ourselves and our swine. Great enterprises tend to rise and fall, it’s what emerges from the ashes that counts. Let’s hope from the ashes of the great American hog we erect another — even if it takes a few decades. I am trying to locate a pull out poster from a magazine my uncle took in the late 60’s, early 70’s. The campaign was You are what you eat and had all sorts of fruits and veggies superimposed over a white hog. I’ve long lost the poster, but would love to locate it and at least print up a copy if it isn’t in print any longer. Am I the only one that remembers it? I sure haven’t had any luck locating it online lol.